Ahh yes, the time honored tradition of the blatant game show ripoff… I love it! Obviously modeled after Deal or No Deal, Deal or No Thanks puts you in the hot seat, except in this version Howie Mandel isn’t there to annoy you to death with his need to state the obvious every five seconds. For those unfamiliar, here’s how the game goes: You can win anywhere from 1 cent to $1 million. You pick a briefcase that contains a secret dollar amount, and then you start opening other briefcases that tell you how much is NOT in the case you picked. You want the briefcases you’re opening to have small dollar amounts in them. 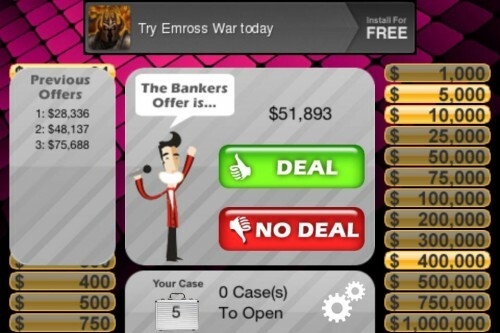 The “Banker” will periodically make offers to buy your briefcase based on the dollar amounts that remain on the board, and if you say no to all of his offers then you win what’s in the case. It’s a guessing game based on the process of elimination.